Last month I shared my story of how I became fascinated with gardening when playing in my grandparents strawberry patch as a child. Today I would like to share one of my families current gardening projects with you. If you follow me on Facebook you may recognize these beautiful succulents. I have never tried growing succulents or cacti before so this is completely new territory for me and I am beyond excited about it. One thing that I find amazing about succulents is that they are supper easy to propagate. Did you know that you can grow an entire succulent from one single leaf? 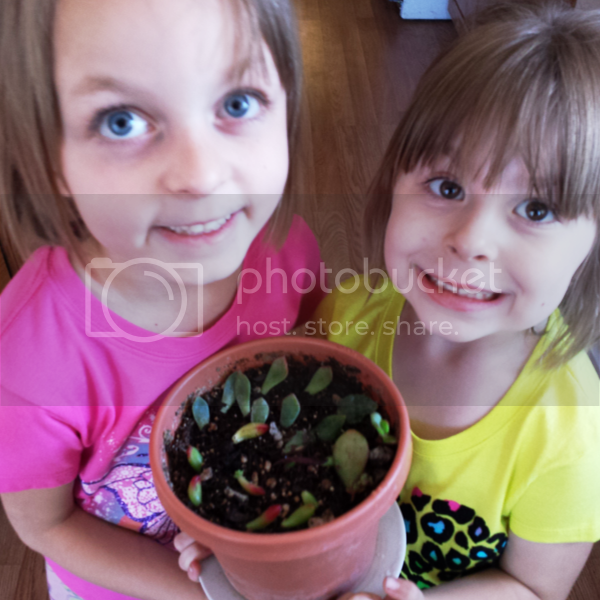 When we brought our succulents home we noticed a few of the leaves had fallen off so we decided to use these to grow a few more. We set our leaf collection in a cool place out of direct sunlight for 3 days (long enough for the ends to dry out a little) then we placed our leaves in a pot with a mixture of 50% sand (from our back yard) and 50% Miracle-Gro Garden Soil. (*Note: Miracle-Gro also has a Cactus, Palm, and Citrus Potting Mix that definitely would have been better for this project but I used what I had on hand at the time). We lightly watered our new succulents and within a few months we will have some beautiful succulents growing. When I talk about gardening you will find that I use the term "we". That is because these two little munchkins are by my side during every gardening project. They definitely share my love of gardening and I love that we can share these moments together!! This is why I use Miracle-Gro. Miracle-Gro takes the guess work out of gardening and allows me to focus more time on creating memories with my family and less time caring for my plants. Be prepared for a mess. If you don't want dirt all over your kitchen floor then take the plants outside. Just go with it. Your kids will probably be more interested in playing with the dirt that actually planting. Let them!! Be patient. Sometimes gardening can take weeks or even months before you can enjoy the benefits. For young kids, this is a hard concept to understand. The may get frustrated at times but as long as you show patience and teach them patience, eventually they will begin to love gardening. Do you have any gardening tips you would like to share? I would love to hear them!! Leave them in the comments below!! Everyone grows for a reason. Some people grow to spend time with their family, or to beautify their community. Some people grow because they love cooking with home-grown ingredients, or because it’s a skill and tradition passed down from generations. Other people grow for personal relaxation, or because they love decorating their homes with freshly cut flowers. When I grow, I Gro Something Greater. I grow for a for FAMILY. What do you grow for? You can head on over to grosomethinggreater.com to watch some great videos as well as share your own personal stories.